Manute Bol the NBA’s tallest player at 7 feet 7 inches has passed away today on June 19th at the age of 47. He played with several teams including: Philadelphia 76ers, Washington Bullets, and the Golden State Warriors to name a few teams that he was actually noted as playing for and he may have not been to the magnitude of Yao Ming but he was a well known center in the NBA and we as humans have a hard time excepting death especially when its not highly anticipated. He was struggling with a kidney ailment and a skin disease and now one of the more notable players in the NBA has passed on and truly will be missed reguardless if he was a Huge impact in the game or not!!!! REST IN PEACE MANUTE!!!!!!!! 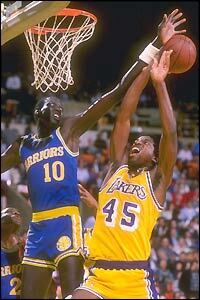 Reguardless Manute u will be missed, REST IN PEACE!!! Moment of silence…….. RIP Manute Bol! He got Game… Is that Jesus Shuttlesworth? Another Setback…..